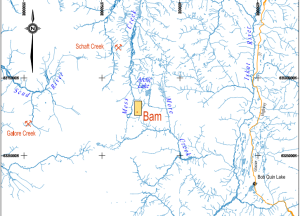 The Bam prospect is located in northern BC, east of the Mess Creek valley, south of Mount Edziza Park, and approximately 80 km south of Telegraph Creek. 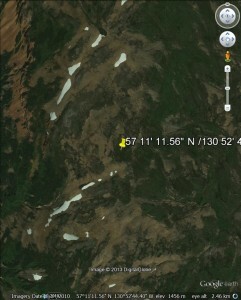 This location is within the “Golden Triangle” of northwestern BC, and is 65 km northwest of the Eskay Creek mine and 20 km south-southeast of the Schaft Creek copper-gold porphyry deposit. Access to the Bam property is by helicopter from Bob Quinn Lake (75 km) or from the Galore Creek access road, currently under construction and located several kilometres south of the property boundary. The MTO tenure (512807) covers 1052 hectares and is in good standing to 2018.09.07. 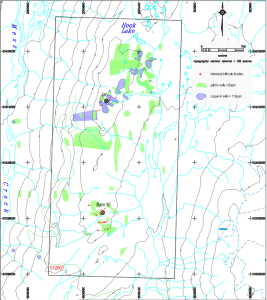 Two known Minfile occurrences (Bam10-104G110) and (Jan-104G027) have historically been prospected for gold, silver and copper. 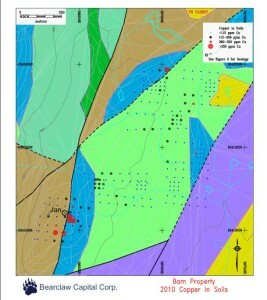 The main exploration target on the Bam is the area of the copper-silver Jan prospect and the geochemical soil anomaly extending to the northeast. 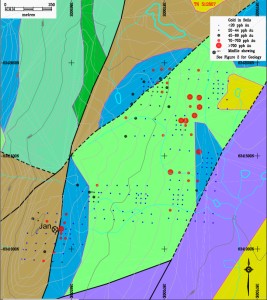 In September 2010, a brief exploration program of limited follow-up soil sampling of anomalous gold values in soils and mapping of the Jan prospect area was carried out. The results of thesoil survey show the presence of several areas having elevated gold-arsenic-antimony copper silver signatures.